Mercoledì, the 3rd of april 2019, at 6:00 p.m., at Superstudio 13 in Via Vincenzo Forcella in Milan, Stefano Boeri is going to take part to a milanese meeting with Pierfrancesco Maran, Councilor for Urban Planning City of Milan. The meeting is part of a series of the Third edition of the event-exhibition “Smart City: People, Technology & Materials”, conceived and organized by Material ConneXion® Italia, curated by Architect Giulio Ceppi e sponsored by the Municipality of Milan, by Lombardy Regional Government, by Camera di commercio di Milano Monza Brianza Lodi, by Aism, Anci, Assolombarda and Siec. The conversation will be also shared by Arch. 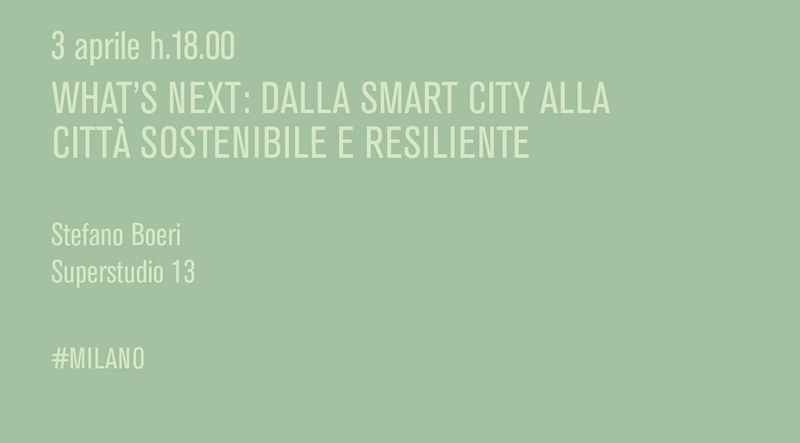 Giulio Ceppi, curator of Smart City; Piero Pelizzaro, Chief Resilience Officer of the Municipality of Milan; Cristian Acquistapace, SVP Energy Efficiency Business Development at SNAM.